Already a few months ago, the uneane person "bearableguy123" made a name for himself on Reddit and Twitter. 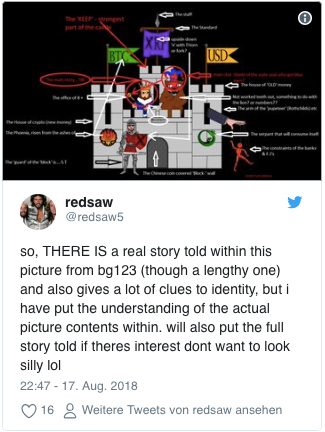 Bearableguy123 was known for his bizarre and cryptic puzzles and images that pointed to future developments at Ripple, quickly gaining a large following. At this point we have to write "war" because after February 14, 2018, when he published his provocative XRP price forecast, he disappeared by privatizing his subredit and closing his Twitter account a few weeks later. The fact is, he made some wild assertions and predictions that came true. He predicted, for example, that MoneyGram would use the products of Ripple. He also knew before the official announcement that MoneyGram and Walmart would cooperate. In addition, she posted numerous pictures of children before Ripple announced that they had donated to sponchose.org for schoolchildren. Some of his other claims, however, turned out to be wrong. 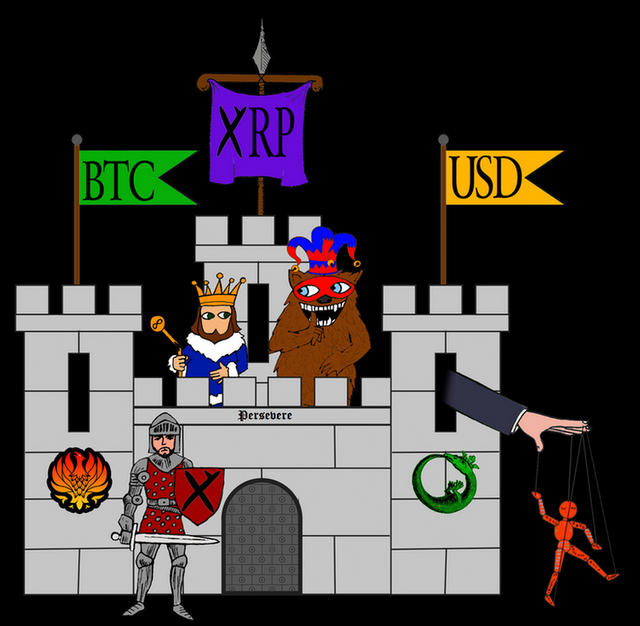 Probably the most well-known release from bearableguy123 besides the XRP price forecast is the following picture showing XRP at the top of a castle, Bitcoin and the US-Dollar. What is the message behind the picture? In the picture you can see several unknown figures, among them a knight resembling Brad Garlinghouse, a king without a mouth, a hand controlling a puppet and bearableguy123 standing next to the mouthless and noseless king in the castle , Next to the knight is a phoenix, a mythical bird that burns or dies at the end of its life cycle to re-emerge from its ashes. Right next to the entrance is Ouroboros, the serpent eating its own tail, which stands for infinity. Exactly above is an arm, possibly a banker who controls the puppet (the population?). The king has no mouth and no nose. In addition, his scepter is broken. Presumably, this indicates that he has lost his power and instead has seized power from the secret person in the castle, the banker. BTC may be the phoenix rising out of the ashes while the USD is in an infinite cycle of inflation, while XRP will become the new world currency and the new global standard for bank transfer. Also interesting is that the Phoenix resembles the very famous cover of the 1988 Economist. On the former cover was the Phoenix, which predicted a new world currency for the year 2018. This has led many to believe that Ripple is in contact with the old banker's family, the Rothschilds. A very detailed description also provides the following tweeted picture of Redsaw. You got a 40.34% upvote from @brupvoter courtesy of @originalathena! Here's a wild speculation on the picture message, which is interesting as hell by the way... First I see on the far right the the government and bureaucracy doing their typical song and dance and propaganda that crypto is for "criminals, money launderers, etc." And also see the green dragon eating itself tail first, which is a genius way of describing the sustainability of current US government monetary spending/printing policy. All being done inside the castle/protection of innuendo and lack of disclosure of its reasons for doing anything, including future legislation of cryptocurrency policy, quite possibly stifling continued growth via ICOs and other future novel ideas of transparency and credible or more sustainable market distribution currencies. 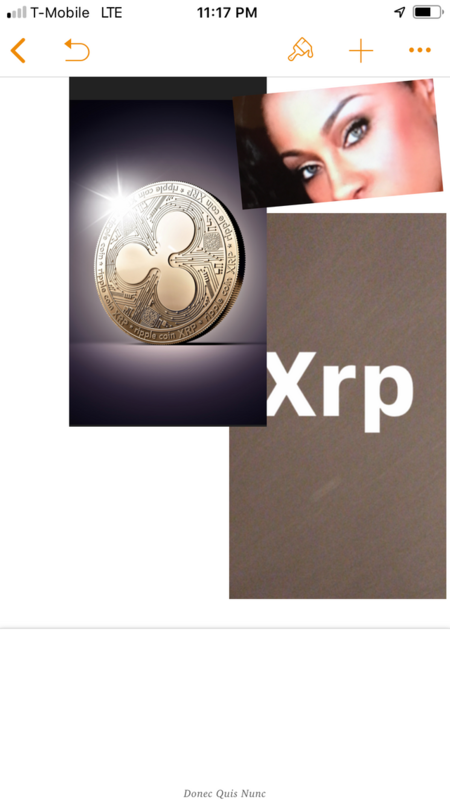 Next I see the relationship of the kind with the broken scepter and no senses except eyes (no mouth or nose) alongside the monster dressed up as a jester with a hush expression as the potential future of making this knight (XRP official) stand in front of the people of the country in some kind of hearing that is basically done to shame cryptos in every way possible, the holders, intellectual supporters and shame the financial press into making this a pariah in all rungs of "enlightened society" while this executive takes a beating in front of the "First World Economies." The king with the broken scepter could also represent a lame duck chief executive that has been marginalized by this media industrial complex (aka the castle here) and they must seek refuge at the mercy of the monster that is also silencing the executive wing of the legislative branch of government in the US. I think the monster also represents future spending that has an inevitable crash in front of it on the horizon, but yet the jester fools and cons the people into looking at other things to distract all of those that hide and make their residence inside of this castle, that has tossed out the XRP official, and having made themselves the back door rulers of the currency, causing a future crash in bitcoin, only to later have it emerge again as the standard of cryptocurrency and alternative economic engine outside of the modern fiat policy that is so heavily geared in the direction of the interests of banking practices done within the "First World" status quo financial interests. After the crash, the BTC (or all of other crypto) after this point is taken in a whole new light and from the ashes it soars like a phoenix as the truths of crypto eventually outweigh the innuendo and slander that is represented by the same media industrial complex that has been the number one cheerleader for continuing current policies that have brought crashes at increasing rates to continue to prop up a failing system that is less market and more will imposed upon the public, as the public finds a better way to get themselves heard in a economic solution that works better for them in a massive, worldwide market driven way outside of automatic indebtedness to the prior Medieval financial institutions created essentially by Dutch capitalists after their revolution, then carried on and perverted over time by crowned capitalists by the states that has reverted them back to serfdom in a simply bigger kingdom. Haha, I love this stuff. Great ink-blot test to where people sit on the side of the fence. I actually did a post off of this comment and linked this post I hope that is okay. If not of course let me know. Thanks so much for upvoting the comment and making this apparent with the great post! nothing more entertaining than conspiracy theory. Haha yes, I love tossing out conspiracy theory. Especially when 'apparent fact' slaps you in the face way harder because it is very easy to craft 'conspiracy theory' when there is such an overwhelmingly low confidence in current financial institutions that are built purely on trust then coercion when the trust runs low. Haha, great comment thanks I love it! I am not for sure about bearableguy 123 but I think the future for ripple and xrp is very bright. No other crypto has been in the news as much lately and they have had some nice upswings lately. Only time will tell though. Great post! The predictions look correct to me. Have you seen this video about Ripple adoption? I can't comment on Bearableguy123. But I feel continuing downfall of crypto value is just a correction. And it’s a right time to purchase Crypto as many as possible. Coming months we will see a drastic high in Crypto market. At that time we may not get a chance. It think it’s a right time to grab coins. And BTC will always be there. XRP & ripple may get some more recognition. That's it. Yup, ripple looks quite strong right now and other big coins will follow. i too feel it. but the news and rumors push back the bull run. i afraid the market will go lower before the bull start. You got a 27.08% upvote from @postpromoter courtesy of @tradewonk! Following and upvoted ! We are in contact. Any price predictions are guessed and you can interprete this picture in 10000 different ways. This is a paint drawing. You make a story out of it.